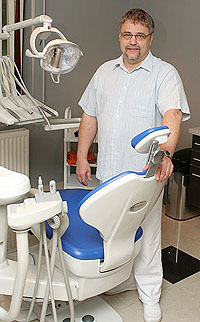 Cosmetic dentistry, dental implants in Hungary! The dental surgery Budadent has been operating since 1992. Our expanding clientele is now served in two newly built dental offices in the green belts of Budapest and Mosonmagyaróvár (in West Hungary). Our friendly offices are equipped with state-of-the-art equipment meeting the latest European standards so that you get the highest-quality services. that can also be used in case the patient is allergic to metals. It may take as little as a few minutes, and it’s painless. A more convenient and safer solution. When bone quantity or quality is insufficient. with your partner, free of charge. A totally denture meeting the highest functional and aesthetic requirements is now available to everybody. Tooth implantation is possible from the time when the patient’s jaws stop growing (age 14-18), and its risks are minimal. Implantation also offers a solution when conventional methods to replace a lost tooth fail. the operation is entirely painless and may be completed in just a few minutes. A tooth replacement with a zirconium-oxide frame has the advantage of not containing metals, so light propagates in and around the replaced tooth almost in the same manner as in the case of natural teeth. Another major advantage is that zirconium causes no allergic reaction even if the patient has an extreme degree of metal allergy. Artificial teeth often contain metals. If the patient is allergic to certain metals, the implant material is of extreme importance. Allergy to nickel and beryllium is the most frequent, but some persons are allergic to gold. There are various solutions to such problems, from choosing the right alloys to 100% metal-free porcelain, zirconium-oxide or unalloyed titanium implants. • Who can get implants?